Cast into the front base of the above Tpe 'C' pst box is "The Meadoe Foundry Co Ltd, Mansfield, Notts"
I am researching one of Mansfield’s oldest firms, Meadow Foundry, based on Littleworth, Mansfield, for over 110 years, next to Mansfield Brewery. 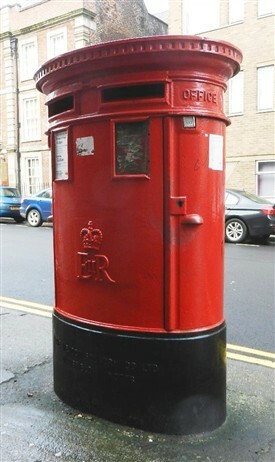 Between 1964 and 1980 the company had a contract from the GPO (as it then was) to produce its new 'C' type double slot post boxes, usually located in large cities. 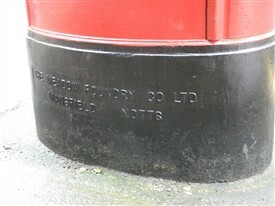 As the illustrations show, the company's name may be seen moulded into the front base of these post boxes (1). Meadow Foundry, Mansfield, was one of the oldest in the town and was founded in 1852, the factory being sited on Littleworth, Mansfield. It stayed at these premises until 1963 when it was relocated to Sheepbridge Lane, Mansfield. It was shortly after this move that the company began making the 'C' type post boxes (in 1964 - see above), it finally closed at this site in the mid 1980s (2). Meadow Foundry at Littleworth was based on a three acre site and in the latter part of the 1800s produced a wide variety of cast iron products including lamp columns, cast iron windows, manhole covers, rain water gutters and downpipes and later on is perhaps well-known for its red cast iron post boxes, which some people are surprised to see the name and address of Meadow Foundry, Mansfield, Notts., cast on to the back of them. Meadow Foundry suffered a serious fire on the 1st of June 1899, which was assessed at the time at costing £5 to £6,000 damage, not an inconsiderable sum at the time. The Mansfield Advertiser shows pictures of the damage, and states that the pattern shop, the smiths shop and joinery shop, were destroyed. The premises were insured and luckily the fire service were able to pump water from the river Maun to use on the fire. In 1899 the Mansfield Advertiser reported on the Notts. Agricultural Show, as Meadow Foundry exhibited at this and produced an advertisement in the paper showing their range of garden equipment, these included cast iron garden rollers, iron garden seats, and cast metal garden vases, all available to order or purchase at the show. In 1912 the works were on strike for an extra two shillings a week, the current wage was 38 shillings a week, the workers wanting £2 per week. Some of its former employees served most of their working life working for Meadow Foundry, reported in the Mansfield Advertiser was Mr Frank Wilson, who retired as machine shop foreman in 1946 after serving 50 years with firm, receiving a gold watch for his service. The Mansfield Advertiser reported a golden wedding in 1946, of Mr and Mrs Evans of Recreation Street, Mansfield. Mr Evans, then aged 70 was supposedly still working for the firm, and was the oldest employee of the company, it was also stated he started working for the firm at the age of 10, and had never had a day off with illness in all his working life, and had only been late three times. (2) www.ourmansfieldandarea.org.uk op.cit. The date of 1982 is given for when the Meadow Foundry went into liquidation. Any more information about this firm would be of great interest. Please leave a 'Comment' via the link below. Thank you. This page was added by Website Administrator on 13/02/2017.